Ralof is a Nord barbarian, a member of the Stormcloaks and an early companion. Captured alongside you, he escapes Imperial custody when Alduin attacks Helgen. If you follow him into Helgen Keep for shelter from the attack, he frees you from your bindings so you can assist him against the Imperial soldiers. After escaping from Helgen, he takes you to Riverwood, where his sister Gerdur lives. He will also invite you to join the Stormcloak Rebellion. Once you complete the quest Unbound, you and Ralof will split up. However, if you decide to join the Stormcloaks, he will fight alongside you and your fellow Stormcloaks in the Battle for Whiterun. You will meet him again when you are tasked with rescuing prisoners from Fort Neugrad, where you learn that Ralof has been promoted and is commanding the troops that will be aiding you in this quest. You will also see Ralof during the quest Compelling Tribute, when you and his soldiers attack an Imperial cart filled with silver and weapons. In battle, Ralof uses his iron war axe and longbow with iron arrows during Unbound, and later on an iron warhammer. Ralof has a sister, Gerdur. She is a Nord lumberjack in Riverwood, and runs the mill with her husband, Hod. Gerdur and Hod have a son, Frodnar. Gerdur's family founded Riverwood, and has lived there for many generations. Gerdur, like Ralof, is a staunch Stormcloak supporter. After the war is over, Ralof can be found living in Riverwood at the Sleeping Giant Inn. Battle for Whiterun: Take Whiterun in the name of the Stormcloaks. Rescue from Fort Neugrad: Rescue Stormcloak soldiers from the Imperials and capture the fort. Compelling Tribute: Blackmail a Talos worshipper into helping the Stormcloaks. If you have escaped Helgen with Ralof, he will direct you towards Gerdur. You can either run ahead to talk to Gerdur before Ralof can reach her, or you can go along with him. If you go to Gerdur first, you can tell her that Ralof said she could help you out. She'll be suspicious at first: "Ralof? How do you know him?" You can answer that he's a friend and he promised she could help, and she'll say, "If you really are Ralof's friend, I'll be glad to help you. But you didn't answer my question - how do you know him?" Alternatively, you can skip this altogether and tell her that you and Ralof escaped from Helgen together. She'll reply, "You did? We heard that Ulfric was captured... ... no, sorry, but in times like these I can't just take the word of a stranger who wanders into town claiming to be my brother's friend." You can reply by saying, "A dragon attacked Helgen and destroyed it. Ralof and I escaped together. ", though Gerdur will be incredulous: "A dragon? In Helgen? It can't be... although... It would explain what I saw earlier... flying down the valley from the south... I thought I must have just been seeing things..." If you instead tell her never mind, she'll be apologetic: "I'm sorry to turn you away. I hope you understand. But look... if you need work, Hod can always use help at the mill." "Brother! Mara's mercy, it's good to see you!" If you chose to tell her about the dragon, you can further mention to her that "That dragon flew off this way. You must have seen it. ", she still won't believe you, however, as she will reply, "You're right, I saw it. But... how's that possible? Dragons don't exist... they're just stories from long ago..." You can say that Ralof will tell her the same thing, and she'll say, "I don't know why... but I actually believe you. You've got the look of someone who's just seen a dragon. Things just go from bad to worse. First the war, now dragons... what's this world coming to?" She'll continue by requesting your help: "The Jarl needs to know if there's a dragon on the loose. Riverwood is defenseless... We need to get word to Jarl Balgruuf in Whiterun to send whatever troops he can. If you'll do that for me, I'll be in your debt." If asked, Gerdur will tell you how to get to Whiterun from Riverwood: "Cross the river and then head north. You'll see Whiterun on its hill as you pass the falls." You can also ask her if she has any supplies you could take. She'll reply, "Like I said, I'm glad to help in any way I can. Help yourself to whatever you need, within reason." You can then pick from a selection of items. You can ask her what she can tell you about the Jarl, and she'll say, "Jarl Balgruuf? I don't mean to be disrespectful, as he's ruled Whiterun Hold well for years, but he seems in over his head now." She'll continue by speculating, "He's been trying to stay out of the war, but it can't last. He's going to have to pick a side. I'm afraid he's going to make the wrong choice." If you further ask her if Balgruuf is loyal to the Empire, she'll tell you, "I wouldn't say that. But he and Ulfric have been at odds for years, and I'm afraid Balgruuf will end up siding with the Empire because of it. But it's hard to believe that even Balgruuf would choose Elisif over Ulfric." Asking her if she supports the Stormcloaks will have her confirm it with "Of course. Ulfric's cause is just. It's time for Skyrim to rid itself of the Empire." She'll continue with her thoughts about the war: "The Empire may have been good for Skyrim once upon a time, but those days are long past. Banning the worship of Talos was the last straw. Thalmor everywhere, dragging people off for honoring our own gods! I'm glad Ralof is helping drive them out of here. If I was a bit younger, I might have joined the fight myself." You can either ask her who Elisif is, and Gerdur will say, "I suppose she's Jarl Elisif now. She married High King Torygg just before Ulfric killed him. The Empire supports her claim to be High Queen. I don't really have anything against her - not her fault that her husband Torygg was bought and paid for by the Empire. But she's nothing but a puppet for the Empire now, with her husband Torygg dead. Ulfric will make sure she never takes the throne as High Queen." 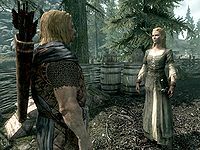 When you ask her if Ulfric killed the High King, she'll reply, "Some say murdered, but it was a lawful challenge in the old way. 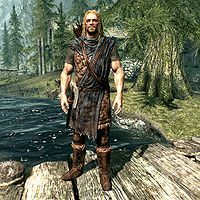 Ulfric called him out as a traitor to Skyrim, and killed him in single combat. If Torygg couldn't defend his throne, he had no business being High King." Mentioning to her that there's no High King now will have her say, "No, not until the Moot meets to choose another. And it won't meet until one side or the other wins the war. Don't worry, though. Ulfric is our rightful High King. He'll drive out the Empire and Skyrim will have peace at last." Gerdur: "Brother! Mara's mercy, it's good to see you!" OR "Brother! Mara's mercy, you're safe! 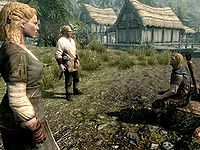 Your friend told me about Helgen..."
Gerdur: "But is it safe for you to be here? We heard that Ulfric had been captured..." OR "But is it safe for you to be here? Won't the Imperials be looking for you?" Gerdur: "Are you hurt? What's happened?" Ralof: "Gerdur... Gerdur, I'm fine. At least now I am." Gerdur: "And who's this? One of your comrades?" Ralof: "Not a comrade yet, but a friend. I owe him/her my life, in fact. Is there somewhere we can talk? There's no telling when the news from Helgen will reach the Imperials..."
Gerdur: "You're right. Follow me." Gerdur will lead you and Ralof to a spot near the mill where no one is around, while she will call call her husband: "Hod! Come here a minute. I need your help with something." Hod: "What is it, woman? Sven drunk on the job again?" Gerdur: "Hod. Just come here." Hod: "Ralof! What are you doing here? Ah... I'll be right down." Gerdur: "Hush, Frodnar. This is no time for your games. Go and watch the south road. Come find us if you see any Imperial soldiers coming." Hod: "Now, Ralof, what's going on? You two look pretty well done in." Ralof: "I can't remember when I last slept... Where to start? Well, the news you heard about Ulfric was true. The Imperials ambushed us outside Darkwater Crossing. Like they knew exactly where we'd be. That was... two days ago, now. We stopped in Helgen this morning, and I thought it was all over. Had us lined up to the headsman's block and ready to start chopping." Ralof: "They wouldn't dare give Ulfric a fair trial. Treason, for fighting for your own people! All of Skyrim would have seen the truth then. But then... out of nowhere... a dragon attacked..."
Gerdur: "You don't mean, a real, live..." OR "When your friend told me, I didn't believe it at first either." Ralof: "I can hardly believe it myself, and I was there. As strange as it sounds, we'd be dead if not for that dragon. In the confusion, we managed to slip away. Are we really the first to make it to Riverwood?" Gerdur: "Nobody else has come up the south road today, as far as I know." Ralof: "Good. Maybe we can lay up for a while. I hate to put your family in danger, Gerdur, but..."
Gerdur: "Nonsense. You and your friend are welcome to stay here as long as you need to. Let me worry about the Imperials. Any friend of Ralof's is a friend of mine." Ralof: "Thanks, sister. I knew we could count on you." Gerdur: "I ought to get back to work before I'm missed, but... did anyone else escape? Did Ulfric..."
Ralof: "Don't worry. I'm sure he made it out. It'll take more than a dragon to stop Ulfric Stormcloak." Hod: "I'll let them into the house and, you know, show them where everything is..."
Gerdur: "Hmph. Help them drink up our mead, you mean. Good luck, brother. I'll see you later." Ralof: "Don't worry about me. I know how to lay low." After she and Ralof bid each other farewell, she will return to work at the mill. "I hope to see you in Windhelm. Good Luck." He is the first NPC in the game to speak. Before you escape Helgen, Ralof will not retaliate if you attack him. If you follow Hadvar out of Helgen, but you join the Stormcloaks, Ralof will not be there. This page was last modified on 10 August 2018, at 17:51.